Everytime we attend a gift or toy show, some wiseacre in a booth looks at my ID tag, sees “The Dinosaur Farm” on it, and says, “Dinosaur Farm? Do y’all grow dinosaurs there?” It was almost funny the first 752 times I heard that line, but now…..not so much. 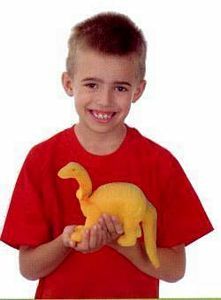 NOW, however I can tell them, “Why yes I do!” and tell them all about this amazing growing dinosaur that goes from 6″ long to over 12″ long! I’ll tell them all about the different dinosaurs and how it works better in purified water and on and on. That’ll teach ’em! 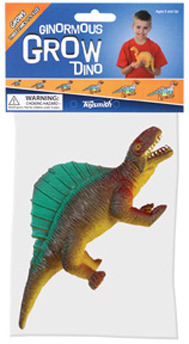 This now comes in a a big 5″ egg shell that you put in water and watch the dinosaur “hatch” out of the egg. Tags: bath, egg, grow, water.